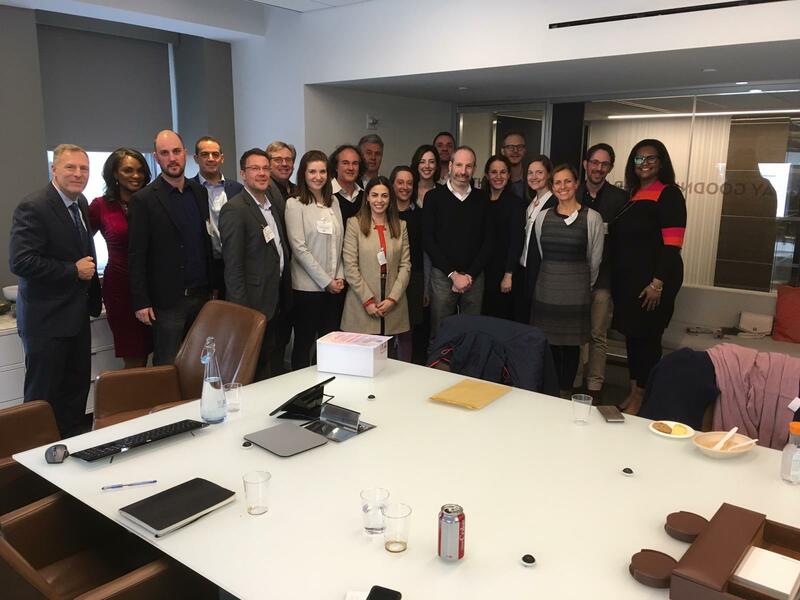 There were about 25 American alumni members and RIAS media prize award winners such as Bill Whitaker of CBS in both of the U.S. cities who joined the 14 German RIAS participants for spirited discussions on Friday March 8 in Washington DC and on Friday March 15 in New York City. 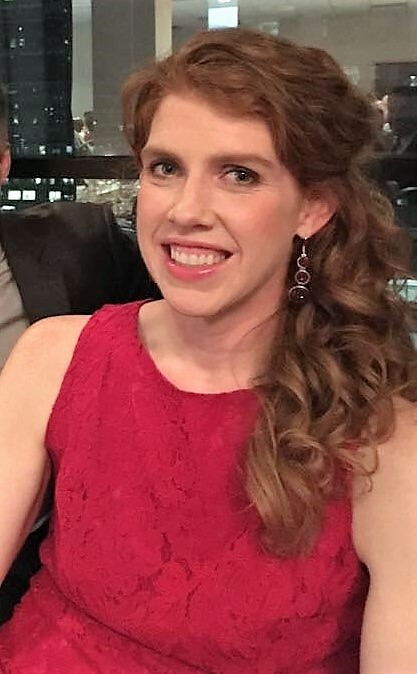 The events were organized thanks to the energy from U.S. chapter leaders Marissa Melton, Michael Garguilo, Clare Toeniskoetter and Stacey Samuel as well as U.S. coordinator KC Schillhahn. 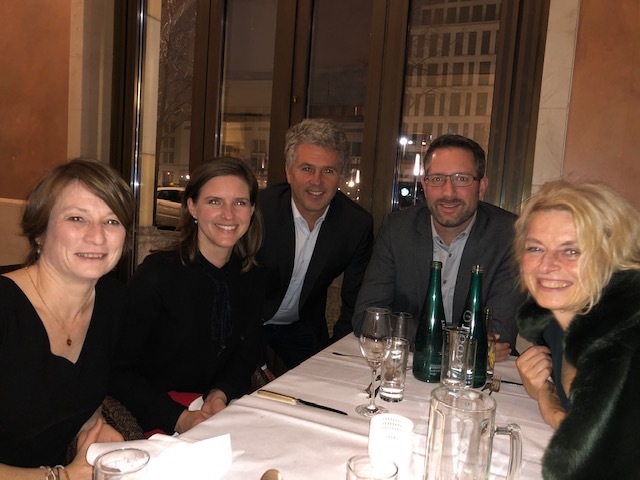 The alumni events in Hamburg — organized by chapter leaders Nadine Gries and Michail Paweletz — and Berlin — which was organized by Vladimir Balzer, Petra Gute and Anja Heyde — were also well attended. 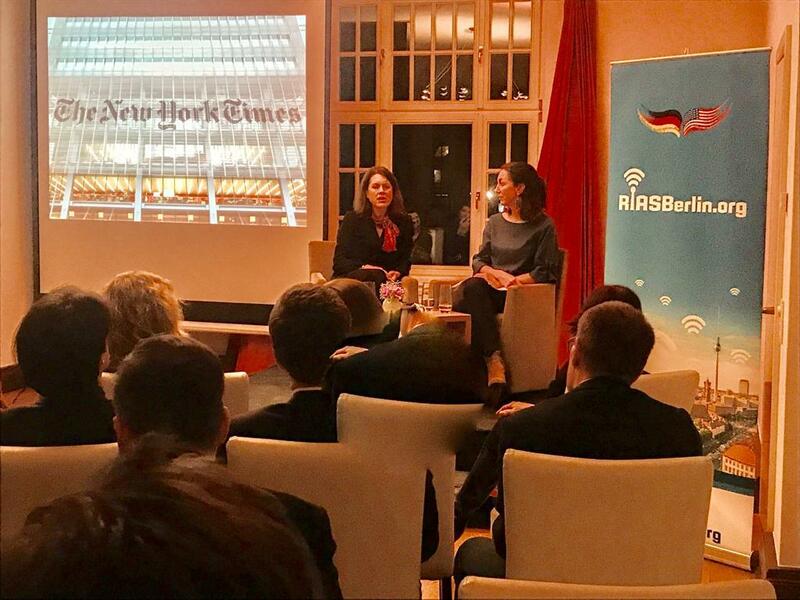 The Cologne alumni chapter is planning an evening get-together on April 3.
for The New York Times in Berlin, took part in a lively panel discussion on March 20 with Jiffer Bourguingon, a former correspondent for Der Spiegel in Washington DC, at an alumni meeting at the Villa Heine at the Elbe. 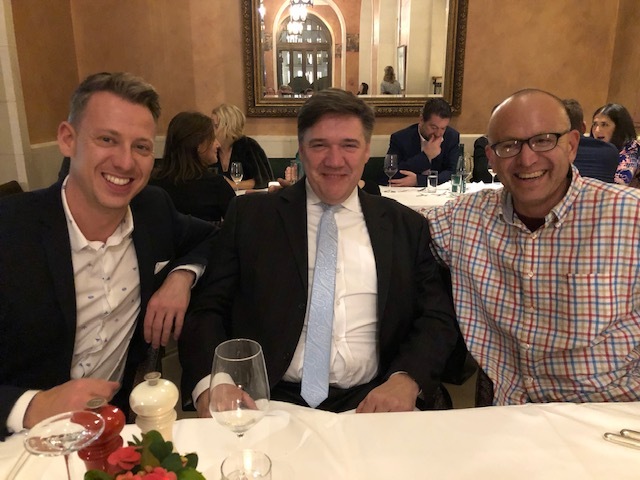 The event was held in cooperation with the Business Club Hamburg for the first time and widely considered a great success with about 10 Hamburg-area RIAS alumni attending, including two-time RIAS fellow Ingo Zamperoni, and another 12 guests from the Business Club Hamburg. 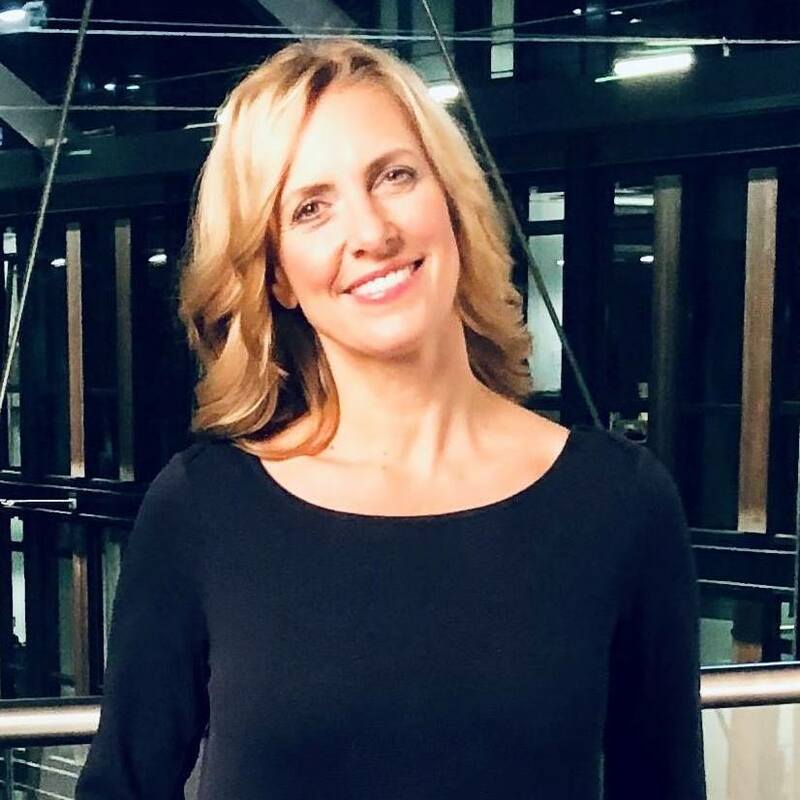 Melissa Eddy talked about her work in Germany for The New York Times, the mission of the RIAS Berlin Commission and her ties to the organization — where she as a board member she volunteers her time to help pick participants for programs in the United States. She also regularly gives talks to American participants coming to Germany. 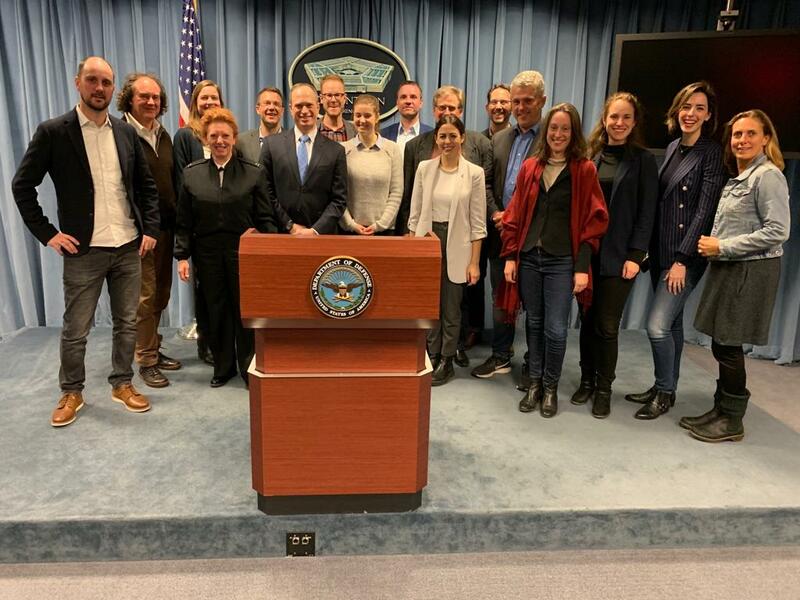 Fourteen journalists from Germany have been meeting American journalists, politicians, Pentagon officials and experts from think tanks on a whirlwind three-week tour of the United States on a RIAS Berlin Commission fellowship. 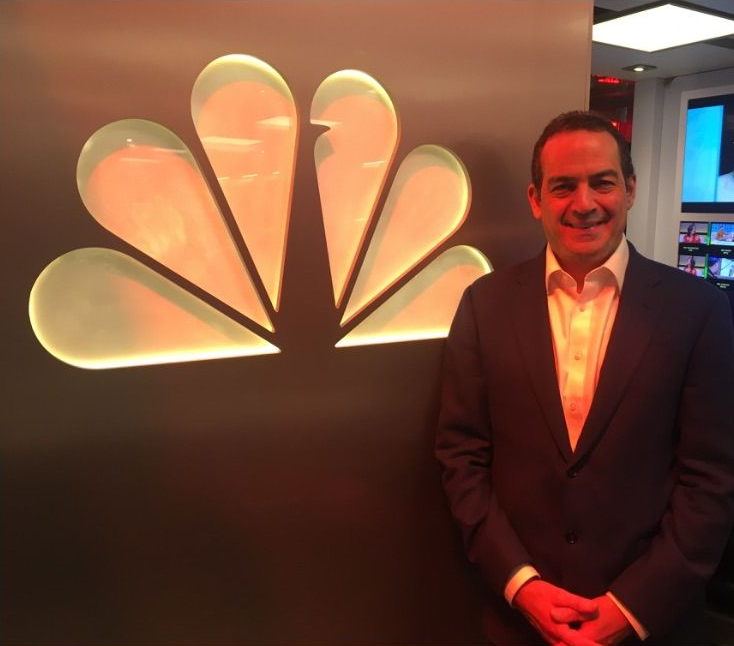 The journalists on the spring group tour had the chance to talk with Noah Oppenheim, president of NBC news, in New York after a packed day of meetings at WNBC, NBC, MSNBC and Telemundo at Rockefeller Center brilliantly led and organized by RIAS alumni Tiffany Zeno, Adam Reiss, Michael Gargiulo and Bryan Weakland. 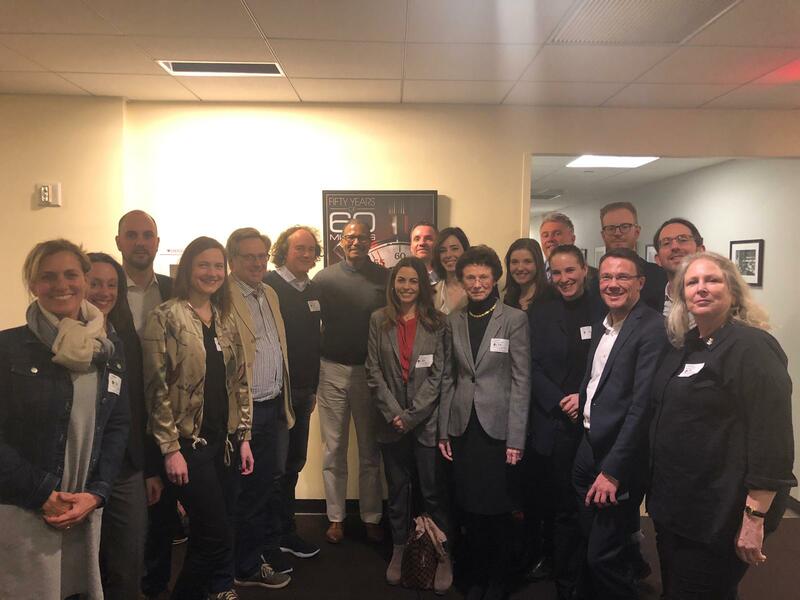 The Germany-based journalists also had the chance to talk to Bill Whitaker of CBS’s “60 Minutes” at his office following a tour of the CBS news studios. The group was later in the audience to watch a taping of “Full Frontal with Samantha Bee”. 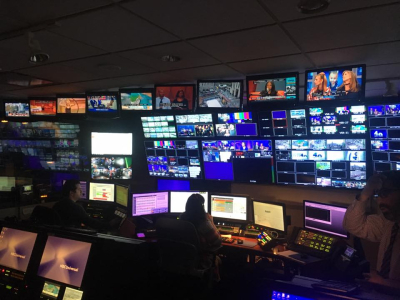 Bloomberg’s broadcasting operations were explained to the group at another stop by Michael Lysak. 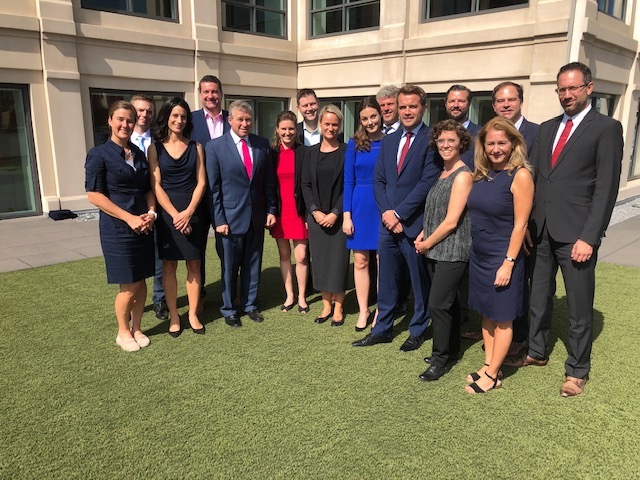 Another highlight during the New York week was a talk with Ambassador Christoph Heusgen at the German Mission to the U.N., who talked about Germany’s role in the world and the country’s seat on the U.N. Security Council as a non-permanent member. 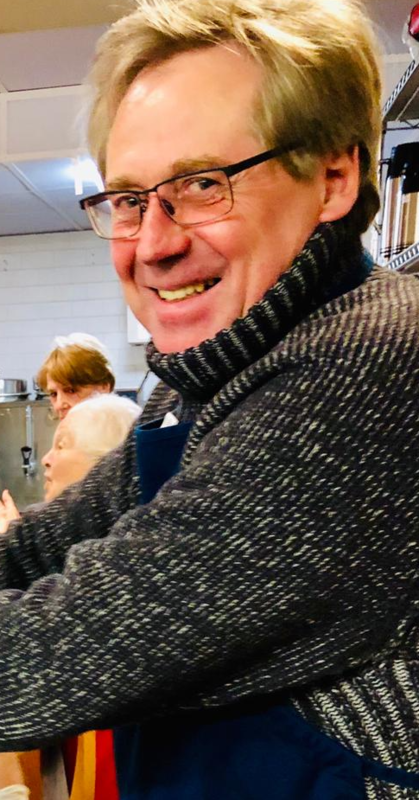 The fellows also had the chance to meet homeless and financially strapped New Yorkers at the St. James Church on Madison Avenue, preparing and serving lunch for about 120 people. insights into the success of the podcast that has attracted millions of listeners in just two years. 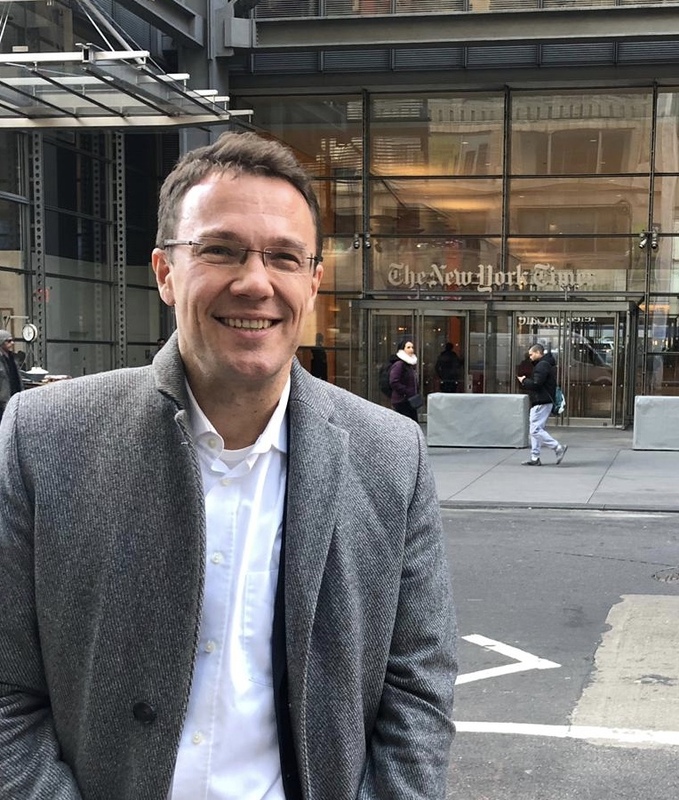 They also talked with German journalists working at the New York Stock Exchange Heike Buchter and Markus Koch. 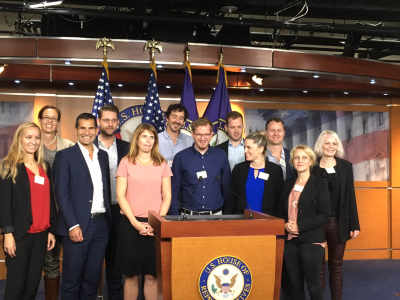 Before traveling by Amtrak to New York from Washington DC, the German journalists also had the chance to talk with congressman Mike Doyle (D-Penn) and former congressman Charlie Dent (R-Penn), who talked about some memorable disputes with President Trump. Despite unseasonably frigid weather and even snow in Washington, the fellows made the most of the week in Washington DC with talks at the Pew Research Center, the Women’s Media Center, the Congressional Black Caucus Foundation, the CATO Institute, Freedom House and a behind-the-scenes tour of the Capitol. They also had the chance to tour the Pentagon and ask spokesman Eric Pahon a battery of questions. 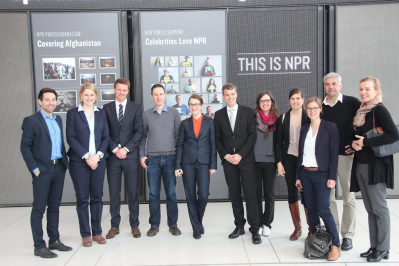 The journalists also had the chance to learn more about the media landscape in the United States thanks to talks at NPR led by RIAS alumni Stacey Samuel, at Deutsche Welle led by Alexandra von Nahmen and the ARD office with Martin Ganslmeyer, Martina Buttler, JP Burgard, Stefan Niemann The week in Washington was capped off with a get-together with about 30 US based German journalists and US alumni. The RIAS BERLIN Commission is proud to announce the winners of this year’s RIAS Media Prize Awards. 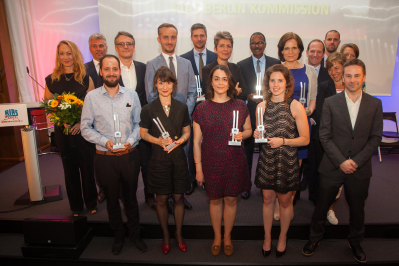 The annual awards ceremony celebrating 27 years of the German-American exchange program and the best of transatlantic broadcast journalism will take place on Thursday, May 23 at 7 p.m. at the RIAS Funkhaus in Berlin. All RIAS fellows and past winners are invited to attend the ceremony and ensuing reception in the historic building. Jury members during their deliberations at the RIAS building in Berlin. 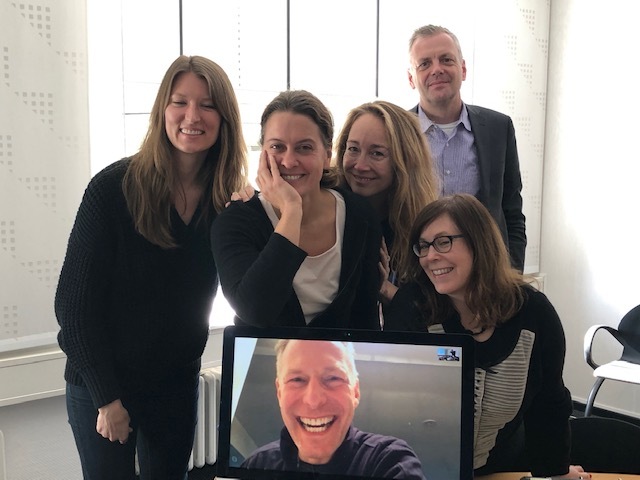 From left to right: Jamie Coughlin (US filmmaker), Anja Heyde (ZDF), Petra Gute (RBB), Christian Wilp (RTL, NTV), Susan Stone (NPR) and (via Skype from New York) Michael Garguilo (WNBC TV). Not pictured: Helge Fuhst (Phoenix). 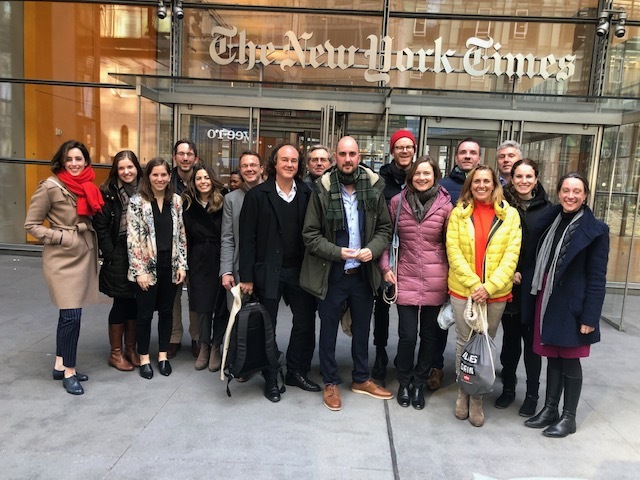 The jury made up of seven distinguished journalists from the United States and Germany met in Berlin to pick the worthy winners in TV, Radio and Digital Media categories. An award for the best fellow story was also picked by the jury. Once again, the jury members were impressed with the high quality of entries in this year’s competition — a total of more than 70 entries were considered in the three categories. 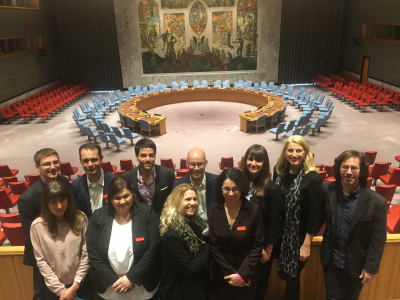 The jury included: Anja Heyde (ZDF), Christian Wilp (RTL, NTV), Petra Gute (RBB), Susan Stone (NPR), Jamie Coughlin (US filmmaker) and Michael Garguilo (WNBC TV in New York), who took part via Skype. Also contributing to the jury’s deliberations was Helge Fuhst (Phoenix). RIAS alumni are also invited to take part in a panel discussion and alumni gathering on Friday, May 24 at 4:30 p.m. at the RIAS building. The documentary “Facebook Out of Control” shows just how much power the company wields over its 2.2 billion users. The filmmakers illustrate the enormous influence the company has on politics worldwide yet also how Facebook takes so little responsibility for the divisions it has created. The filmmakers have brilliantly put together previously unpublished material to take a deep dive into the psyche of its founders and the question of whether the world’s most powerful company is bringing people together or driving them apart. Donald Trump has been shrugging off criticism as “fake news“ ever since his first press conference as President-elect. He has used that term often to discredit the media. But now it has led to a larger debate about what is true and what is fake. The documentary “Fake factories” impressively illustrates that debate and offers viewers insights into the business of truth. In a thoroughly absorbing way, the feature shows how millions of Facebook, twitter and WhatsApp users can be manipulated when fed with fake news, leaving behind confused societies that are seeing the erosion of a common ground for information and debate. August 27, 2018, RTL (Spiegel TV). This chilling story explores how the violent American Nazi terror group Atomwaffen Division is making ominous in-roads into other countries, including Germany. A gripping report on the most fanatic of right-wing groups told through innovative usage of digital media that pushes the boundaries of online storytelling. This entertaining story, produced during Eberhard Schade’s participation in the RIAS USA program, is an insightful exploration of what happens when gentrification meets contemporary career culture – forcing people well-beyond college into dorm-style living arrangements. This cautionary tale about the tech and real estate sectors in San Francisco and New York is relevant for other urban areas, particularly in Germany. 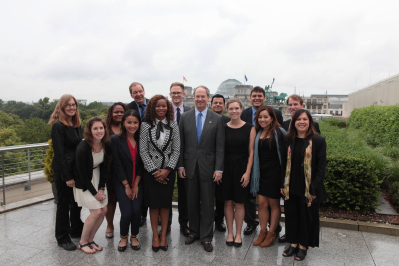 Fourteen broadcast journalists based in Germany are heading to the United States for a three-week RIAS Berlin Commission fellowship that starts on March 3. The journalists will spend a week visiting congressmen from both the Republican and Democratic parties, media outlets such as NPR and Deutsche Welle, think tanks such as Pew Research Center, the Women’s Media Center, the Congressional Black Caucus Foundation, the CATO Institute and the Freedom House. They will also visit the Capitol building and the Pentagon. Their week in New York City will include meetings with journalists on Wall Street, at the NBC headquarters, the New York Times, Bloomberg and CBS News. 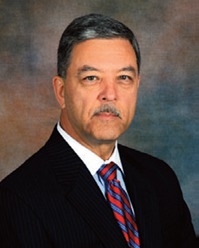 They will also meet the CEO of the AJC David Harris and the director of programs at the Tenement Museum, Kathryn Lloyd. The group will also meet Christoph Heusgen, Germany’s permanent representative to the United Nations. 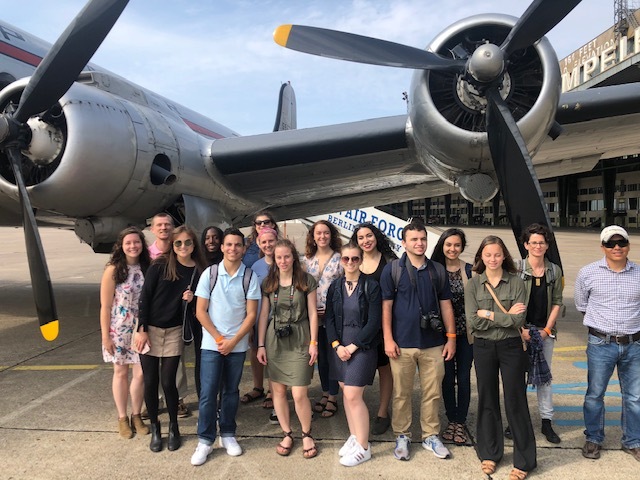 The fellows will then spend the third week visiting with American broadcast journalists at their stations across the country, from Bloomington, Indiana, to Bend, Oregon, from San Antonio, Texas, to Sioux Falls, South Dakota. Denver, Los Angeles, Seattle, San Francisco, Houston, Cincinnati, Tulsa are also station week destinations for some of the German journalists. Others will spend a week in Tyler, Texas and Spartanburg, South Carolina. 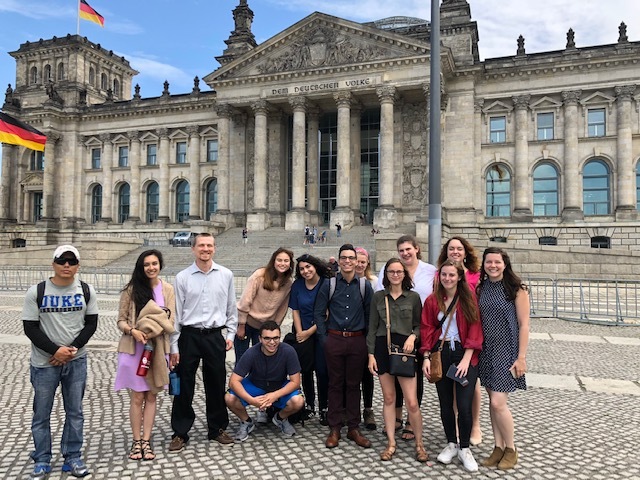 After its successful launch in 2018, the RIAS Berlin Commission’s three-week summer exchange program for college students will be back again in 2019. 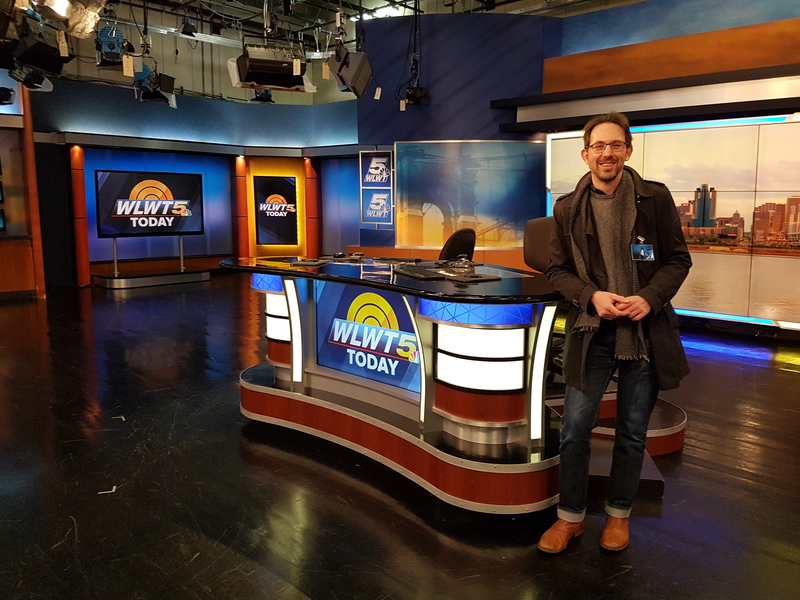 Students of journalism, international relations or associated subjects who have some broadcast journalism experience or are interested in careers in broadcast journalism are welcome for the fellowship. The deadline for applications is February 16, 2019. 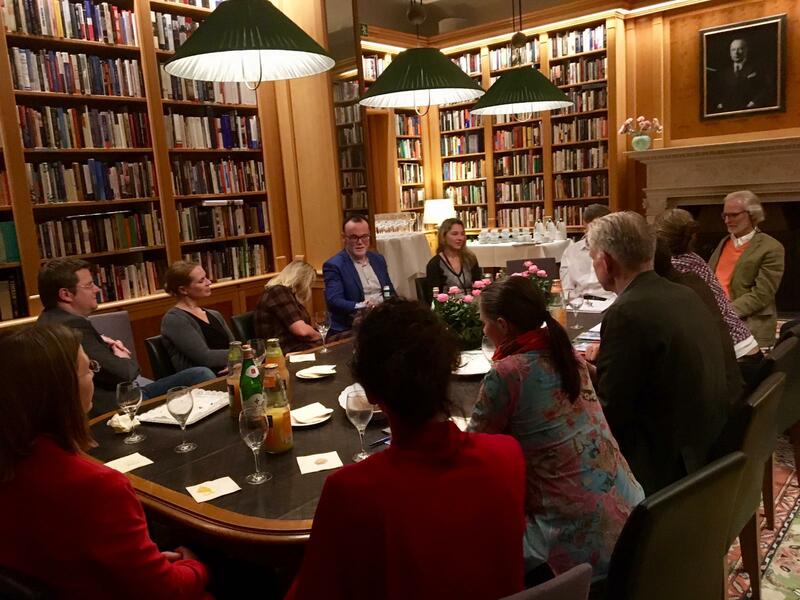 During the first three weeks of July, participants will meet with leading political analysts, journalists, think tank representatives and other experts in Berlin, Cologne, Hamburg and Leipzig. 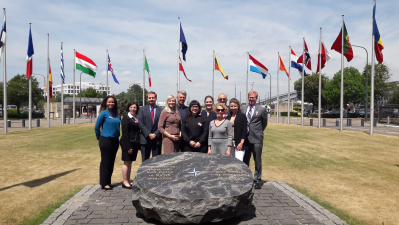 They will visit German government institutions, historical sites, and universities, enabling them to and deepen their knowledge of central issues in transatlantic affairs and gain a more personal understanding of German politics, media and history. The program runs from June 30, 2019 to July 19, 2019. 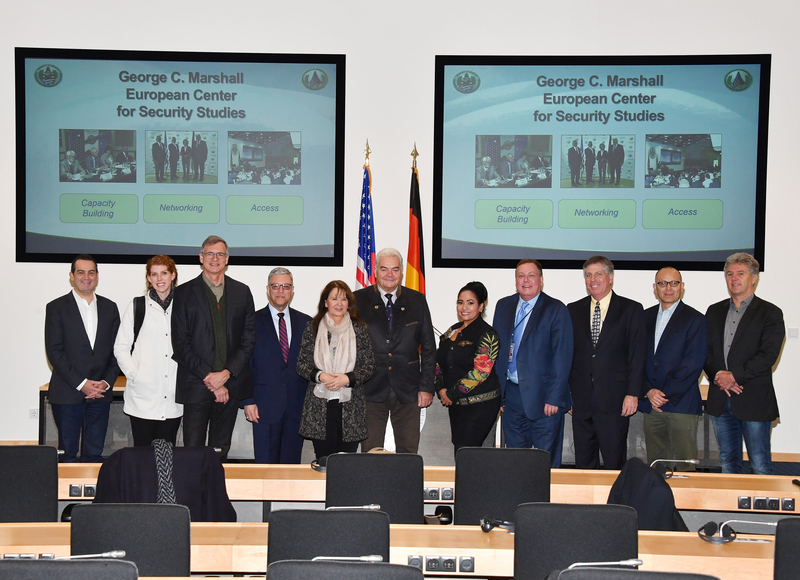 The program is funded by the Transatlantic Program of the Government of the Federal Republic of Germany, with additional financing from the RIAS Berlin Commission. 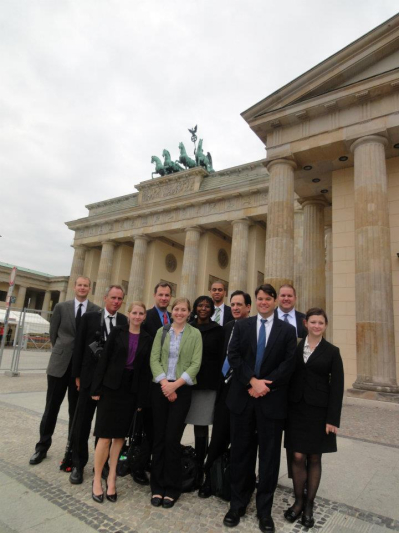 Participants receive round trip air travel from their home states to Germany, ground and air travel in and across Germany, and hotel accommodations during the program. Some meals are also provided during the program. Participants will leave the US no later than June 29th and return no sooner than on July 20th. They may arrive earlier or later than these dates, but must cover any additional costs themselves. Each participant will be required to contribute €500 to help cover the cost of the program and must pay for their own meals. The application deadline is February 16, 2019. Leading applications will be interviewed by skype or FaceTime before the final selection of the program participants is made in March. You can download the application form here. Please send end your application materials in electronic format (PDF preferred) to info@riasberlin.org by February 16, 2019. 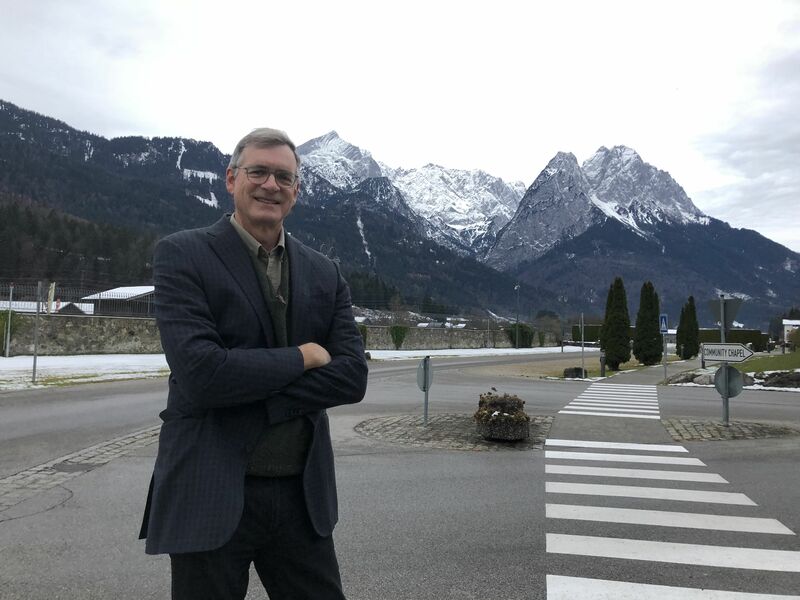 Private donations to the RIAS Berlin Commission nearly doubled in 2018 to a total of just under 8,000 euros with contributions coming from more than 50 alumni and friends of RIAS in Germany and the United States. Those donations will help make it possible to expand the programs in 2019. 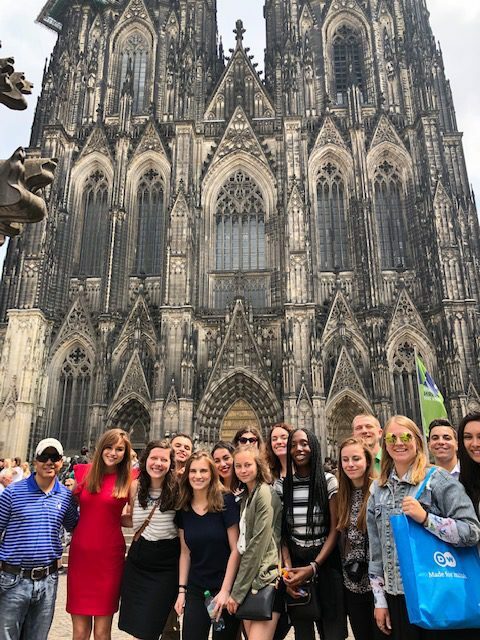 All donations raised from alumni and friends of RIAS are being used directly and entirely for additional spots on the exchange programs for journalists between the United States and Germany. There were a total of 78 journalists on exchange programs in 2018, which was up from 54 participants in 2017. 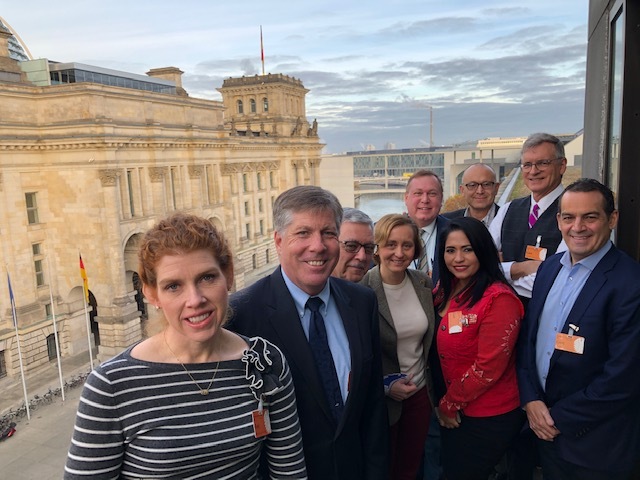 The RIAS Berlin Commission is hoping to expand further to a total of 100 exchange program participants in 2019 with a special expanded one-week senior editors and alumni program November to celebrate, mark and report on the 30th anniversary of the fall of the Berlin Wall. 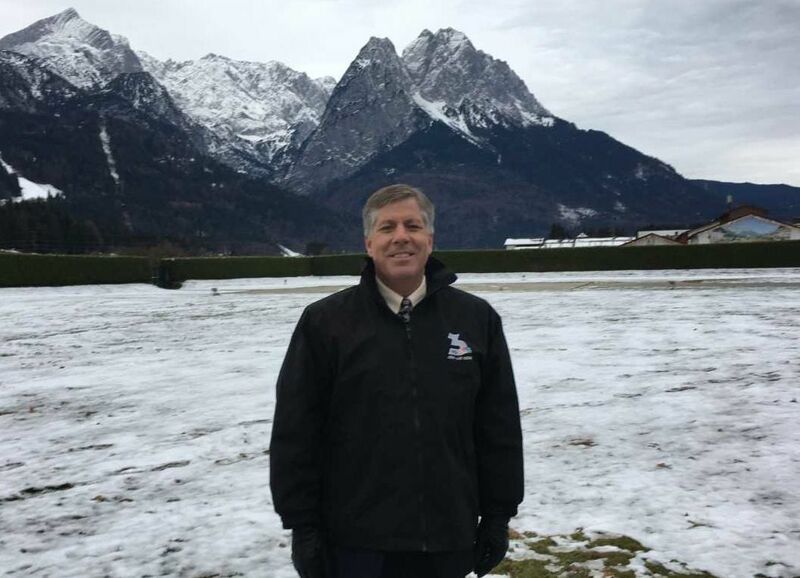 The donations in 2018 included 5,365 euros from 30 alumni and friends of RIAS in Germany and $2,545 from 24 alumni and friends of RIAS in the United States. There was a wide range from individual donors in 2018, from $50 to $500 in the United States and 30 euros and 2,000 euros in Germany. 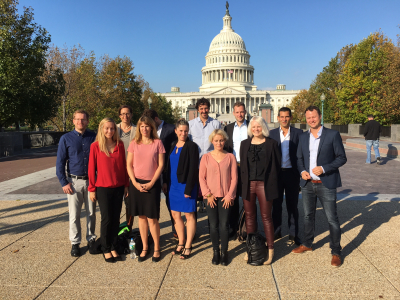 The alumni chapters set up in Hamburg, Berlin, Cologne, Rhine-Main, Brussels, New York, Washington and Los Angeles are helping spread the message on donations. With more than 1,600 alumni over the last quarter century, the RIAS Berlin Commission is hoping to double the amount of donations once again in 2019. The main RIAS Berlin Commission’s annual Media Prize awards ceremony will be held on May 23 at the RIAS building in Berlin. There will also be a panel discussion and alumni get-together the following evening in Berlin on May 24. All alumni are cordially welcome to attend both events. 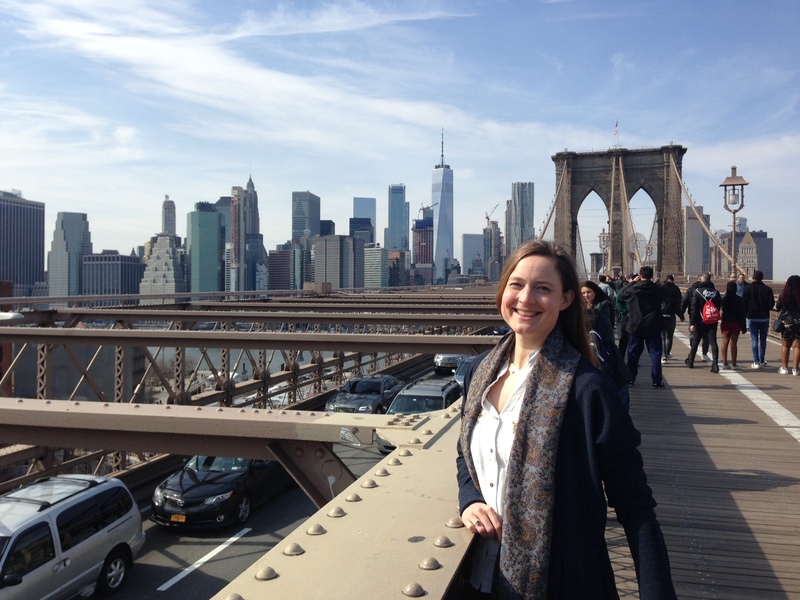 In the United States, alumni get-togethers are planned for Washington DC on March 8 and in New York City on March 15. There will also be a series of alumni events in San Antonio at the RTDNA Excellence in Journalism convention on September 6 and 7. 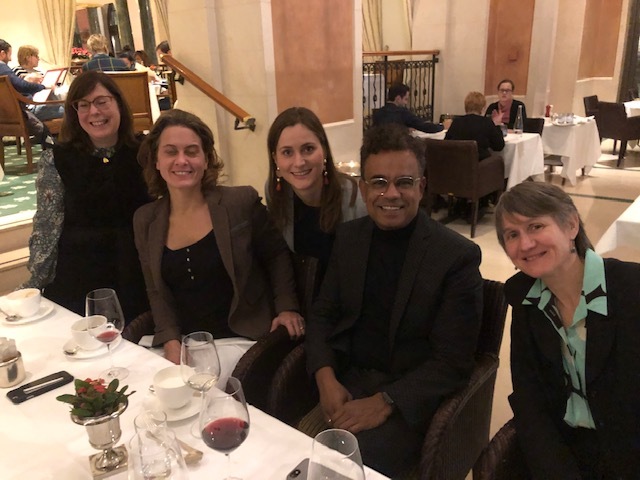 A heartfelt thanks from the RIAS Berlin Commission to all those friends who made donations in 2018: Kerstin Koretz, Kevin Arnold, Sonja Christen, Helge Fuhst, Juergen Schleifer, Ben Fajzullin, Patricia Adenauer-von Berg, Martin Richter, Birgit Franck, Anne Kristen Sieger, Stephanie Orbach, Louisa Maria Giersberg, And Riekmann, Bartosz Dudek, Charlotte Potts, Matthias Baehr, Oliver Sallet, Maja Freudenberg, Christine Langer, Sarah Schmidt, Peter Twiehaus, Marcel Grzyb, Frank Hofmann, Erik Kirschbaum, Katja Weber, Michael Roetzscher, Anna-Maria Schuck, Felix Wessel, Christian Walther, Jan-Peter Bartels, Sarah Williams, Justin Campell, Marilyn Geewax, Adam Reiss, Stacey Samuel, Miranda Dotson, Stephanie Wolf, Gitzel Puente, Kane Farabaugh, Lane Luckie, Thomas Hawley, Bonnie North, Jessica Prater, Judith Snyderman, Bryan Weakland, Cameron Knowles, Emily Damm, Dustin Stephens, Carol McKinley, Jennifer Macdonald, Michael Gargiulo, Scott Libin, Okawa Hisashi, Helene Finn Kane. of Germany and of the United States. Eligible are all kinds of reports on German topics aired in the US or on US topics aired in Germany or other programs with German-American aspects in the fields of international politics, economics, social issues, cultural developments or current events. 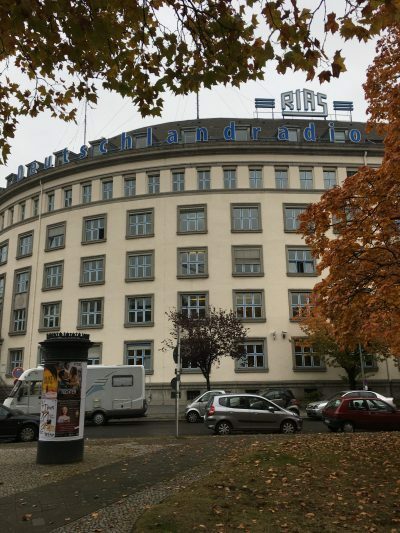 The winners will be honored at the RIAS Media prize awards ceremony on May 23, 2019 at the historic RIAS building in Berlin.Awards are presented in three categories: Radio, TV, and Digital Media. In order to qualify a report must have been on a German topic aired domestically in the U.S. or on a U.S. topic aired in Germany, or be another local, national or international story of mutual interest.Entries from recent and former RIAS Fellows are welcomed, and encouraged. 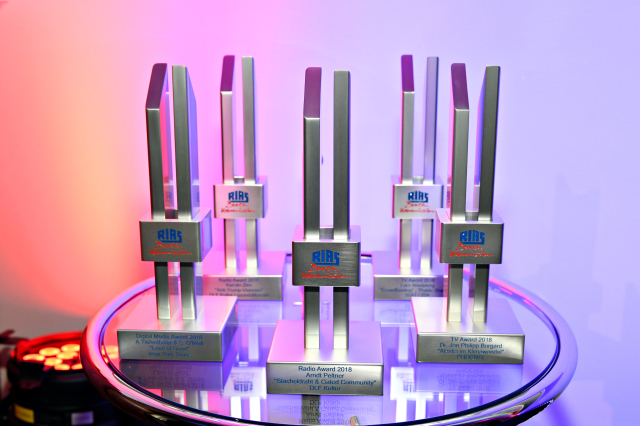 Entries must be radio, television or digital stories aired in 2018 and may be single stories or multi-part series. There is no length requirement. All entries must be submitted electronically, with a URL for the story, and an attached script. 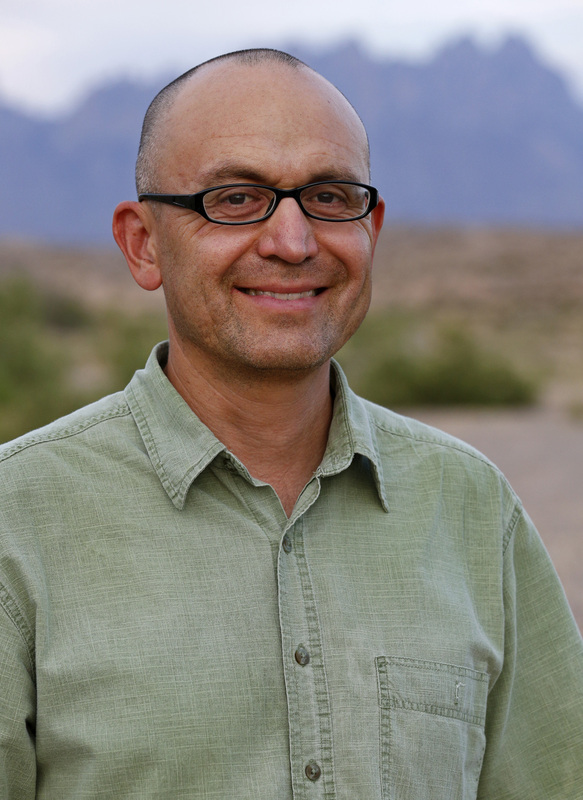 Recent American winners include JP Burgard’s film on ARD and Phoenix TV about climate change in Alaska, Bill Whitaker from CBS’s “60 Minutes” for a story comparing prisons in Germany and the United States, Paige Sutherland of New Hampshire Public Radio about Germany’s handling of drug addiction; also Erik Olsen and Melissa Eddy in 2016, for a pair of stories on nytimes.com: Germany’s Coal Addiction and Germany’s Energiewende.The entry deadline is January 15, 2019. To submit, simply send a link to your story to info@riasberlin.org. Scripts and support materials are optional. Please review the call for entries on the RIAS Awards page for specific rules and details and visit our German/American exchange program page for more information. 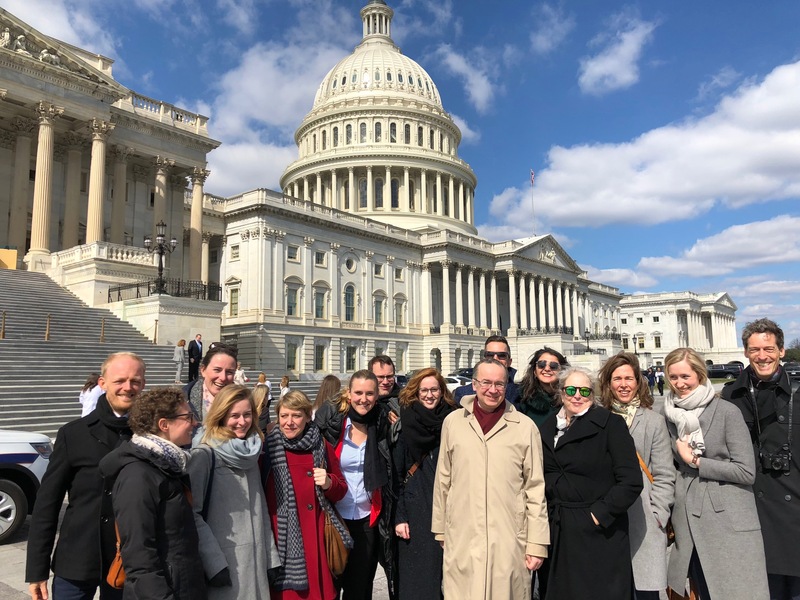 Alumni groups in Germany and the United States have been busy holding good-spirited alumni meetings, seasonal get-togethers and fundraising activities for the RIAS Berlin Commission. 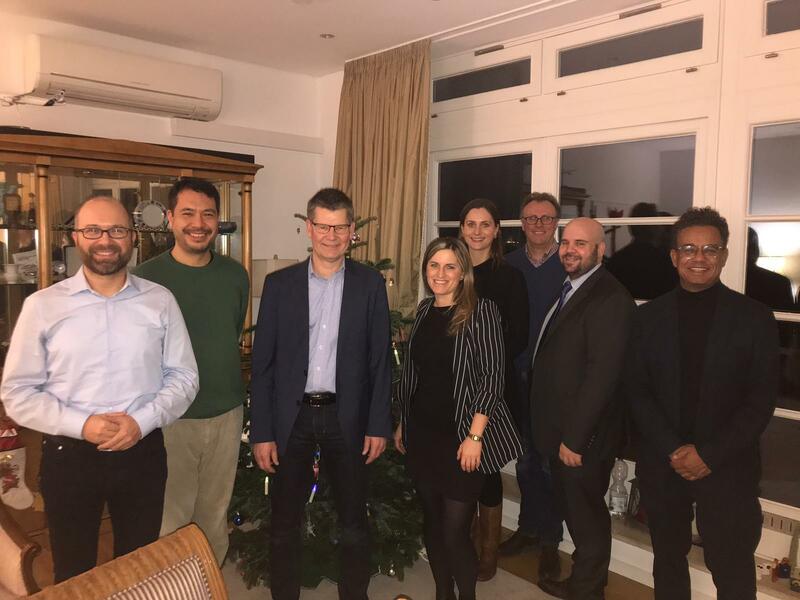 The Hamburg alumni chapter recently had a fireside chat with U.S. Consul General Rick Yoneoka at his private reisidence in Hamburg that was organized by Nadine Gries (NDR) and Michail Paweletz (ARD). 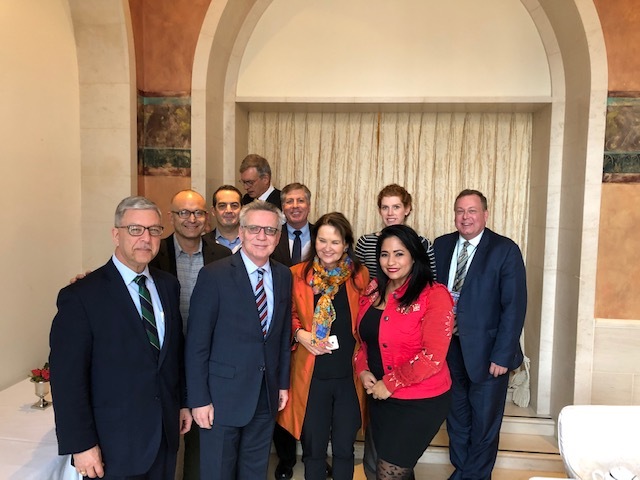 “We had great talks and got to know the Consul General on a more personal level,” said Gries, a RIAS alumni from 2016 of the dozen alumni that attended. 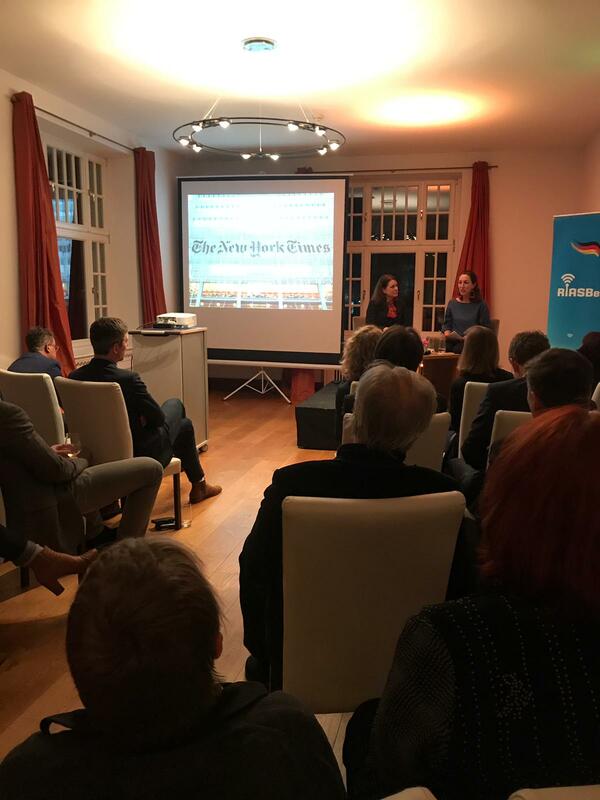 “It was a good night for German-America relations and a perfect kick-off event for the RIASBerlin Hamburg chapter.” The Hamburg chapter is planning another alumni meeting in early 2019. 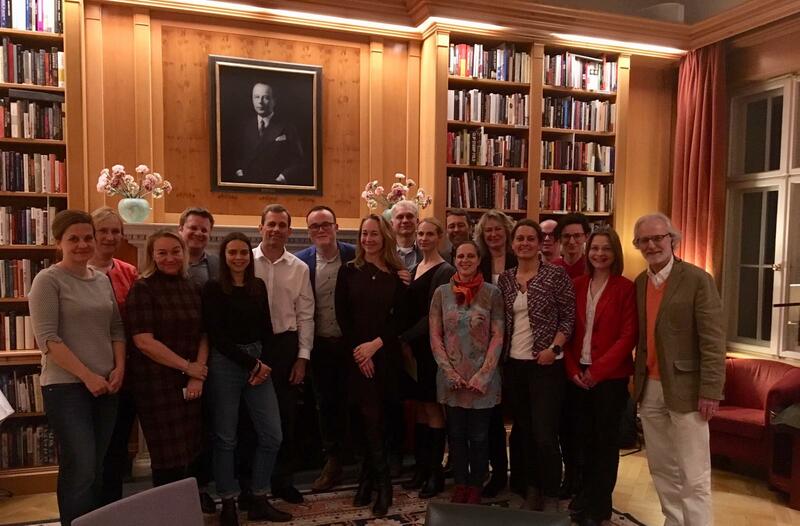 The Berlin alumni chapter and Hamburg chapter held a joint Thanksgiving dinner celebration in Berlin at the Adlon Hotel on November 24 that was attended by 35 people — including RIAS Berlin Commission co-chair Christina Higgins, who is the Minister Counselor for Public Affairs at the U.S. Embassy in Berlin. It was a spirited evening and alumni from both Hamburg and Berlin said they hoped to have more such events together in 2019. The event was organized by Oliver Sallet (Deutsche Welle), Anja Heyde (ZDF), Nadine Tries and Michail Paweletz. 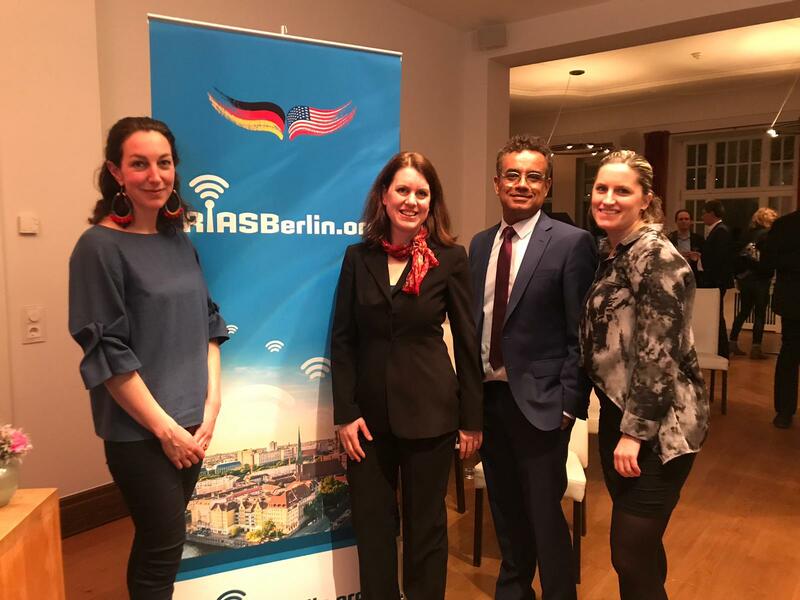 The Berlin alumni chapter will also be joining RIAS Berlin Commission board member Melissa Eddy at the U.S. Embassy on December 18 for an annual holiday reception at the U.S. Embassy in Berlin with other alumni groups. 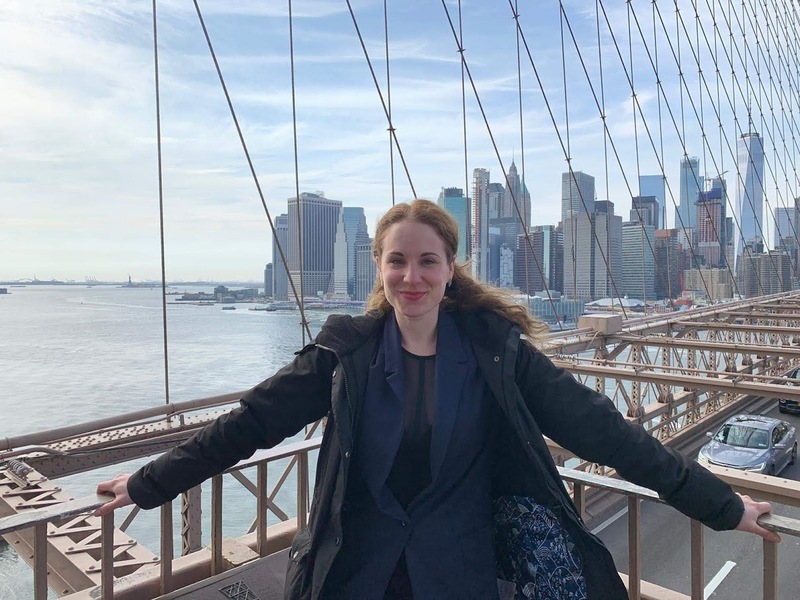 In New York, the RIAS Berlin Commission alumni chapter kept the German-American spirit alive with a get-together at a German beer hall in the East Village called “Zum Schneider”. 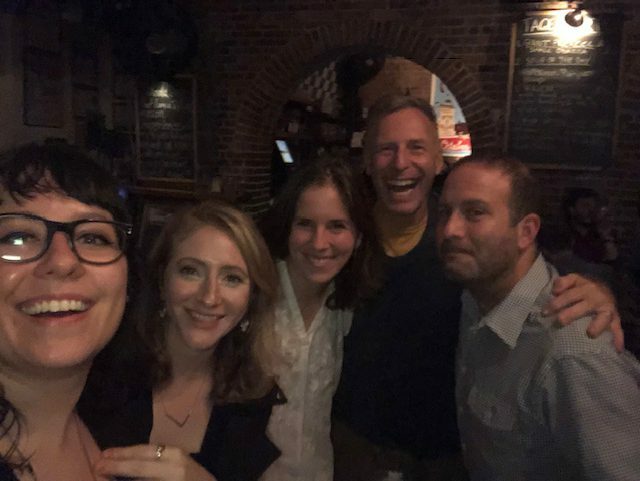 New York alumni Clare Toeniskoetter (The Daily at the NYT) and Michael Gargiulo (WNBC TV) report that the New York chapter hopes to start a tour of the five New York boroughs “one German beer hall at a time”. The next stop is Queens planned for sometime early in 2019. 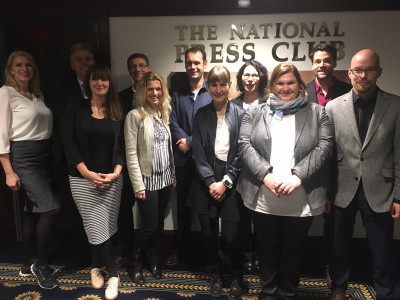 The New York chapter alumni will also meet the next group of 14 RIAS journalists from Germany on the March 2019 program at a get-together on March 15. 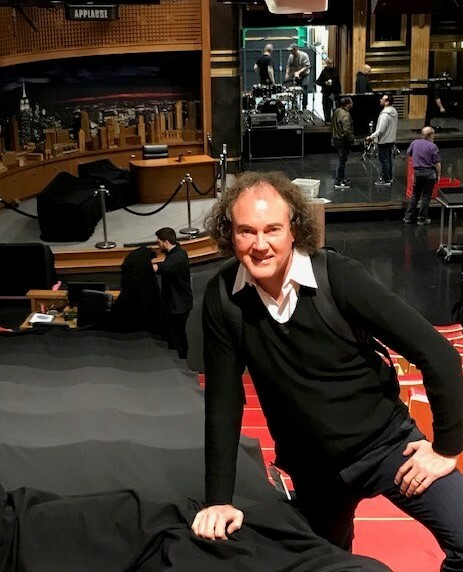 In Washington DC, a group of RIAS alumni got together for a screening of a new 2018 film “The Silent Revolution” in which the Cold War-era radio station “RIAS” (Radio in American Sector) plays a feature role. As Marissa Melton (VOA), who organized the event, noted: “The role that RIAS plays is really pivotal. It’s also great to see it making a difference in people’s lives.”The Washington DC chapter is also planning a fundraising event called “RIAS Rent Party” to try to help raise alumni donations to the $10,000 target for 2018 — or in other words enough alumni donations to add two spots to programs in 2019. 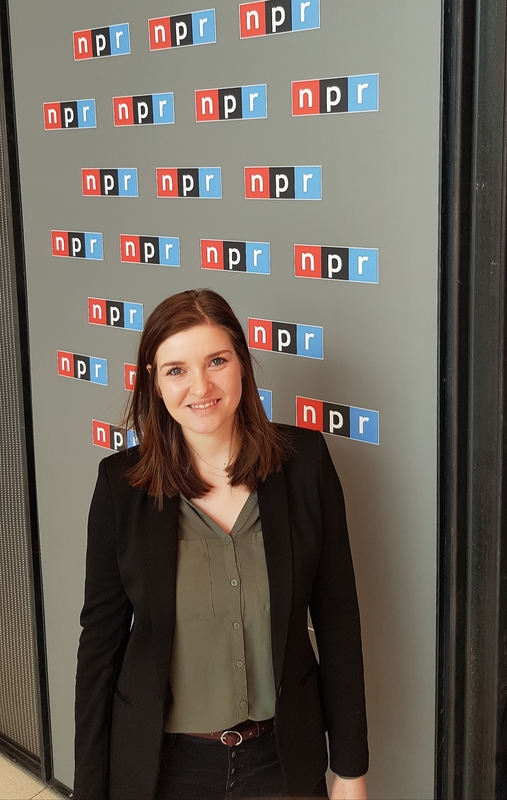 Stacey Samuel (NPR) is trying to organize the event at a beer garden in Washington. 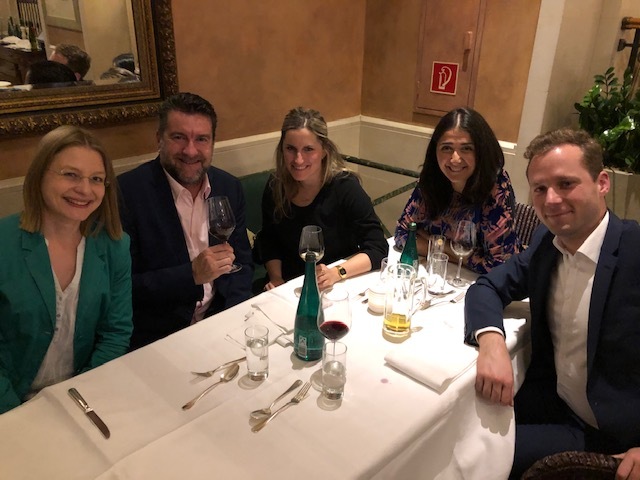 The RIAS Berlin Commission would like to say thank you to the alumni and friends of RIAS for their generous donations: Kerstin Koretz, Kevin Arnold, Sonja Christlein, Erik Kirschbaum, Helge Fuhst, Juergen Schleifer, Ben Fajzullin, Patricia Adenauer-von Berg, Martin Richter, Birgit Frank, Ann Kristin Sieger, Kevin Arnold, Stephanie Orbach, Torsten Beermann, Louisa Maria Giersberg, Arnd Riekmann, Bartosz Dudek, Charlotte Potts, Matthais Baehr, Oliver Sallet, Martin Guenther, Christian Walther, Eva Schmidt, Marcel Grzyb, Mirella Pappalardo, Laura Koppenhoefer, Peter Twiehaus, Kai Wessel, Anne Demmer, Wolker Witting, Susan Blum, Karl-Dieter Moeller, Andrea Lueg, Joerg Machenbach, Katja Weber, Silvia Tiegs, Katharina Borchardt, Dorte Stoermann, Dominik Jozic, Regine Muender, Michael Paweletz, Lane Luckie, Thomas Hawley, Bonnie North, Jessica Prater, Judith Snyderman, Bryan Weakland, Cameron Knowles, Emily Damm, Dustin Stephens, Jennifer Macdonald, Michael Gargiulo, Scott Libin, Okawa Hisashi, Helene Finn Kane. Thank you RIAS Berlin Kommission for a wonderful eye opening week in Germany and Croatia. I suppose Dr. Hildegard Boucsein put it best during our last “meeting” in the hotel bar in Zagreb, “There is no black and white. There is gray, and many shades of gray”. So true, and definitely displayed during the high level meetings we attended. The small group environment was conducive for great interaction by all. I had a terrific experience. I’m sure my colleagues did as well. 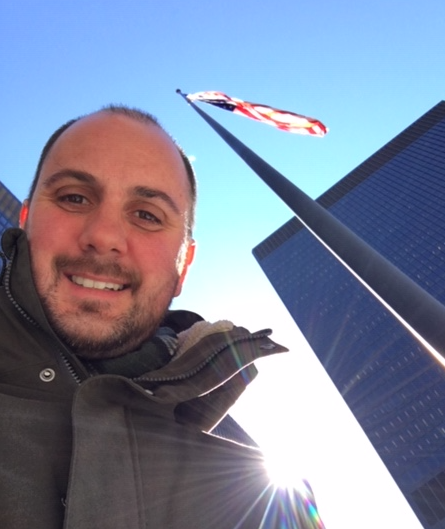 I may be the first law enforcement and homeland security expert to accompany U. S. journalists participating in the RIAS program. I must “confess” (law enforcement term) that I found the program to be without equal and the knowledge and experience gained from this trip; and having the opportunity to visit with very senior government officials for their perspective on migration and border security issues, was most rewarding and educational. Hildegard and Erik assembled a superior team of U. S. journalists who proved to be consummate professionals. The RIAS program provided tremendous educational value and it was an honor to participate in the program. Hats off to Hildegard and Erik, who were not only great hosts but extremely knowledgeable about the many issues briefed and discussed and were able to provide insightful background and clarifying detail on many of these issues that I had scant knowledge of. We effectively live on an island in the United States. Americans are obsessed with their own concerns and, as journalists, we serve this domestic appetite for news. It is essential, as global citizens, to break out and see other hemispheres and hear about their problems, to help reframe our own. Spending a week with the RIAS roadshow in Berlin, Bavaria and Croatia forced us to acknowledge immigrant and border problems more serious than our own. Moreover, the European backdrop of world wars, genocide, and the Balkan conflicts adds a level of complexity to the whole picture. 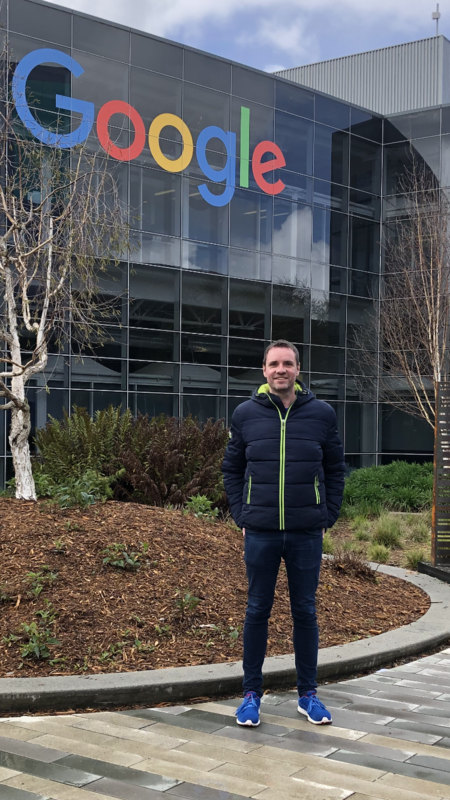 Thank you, Erik and Hildegard, for extracting us from our journalistic comfort zone, and for swelling our stomachs with some remarkably delicious food and drink! RIAS Senior Editor Tour on Immigration was eye-opening would be an understatement. 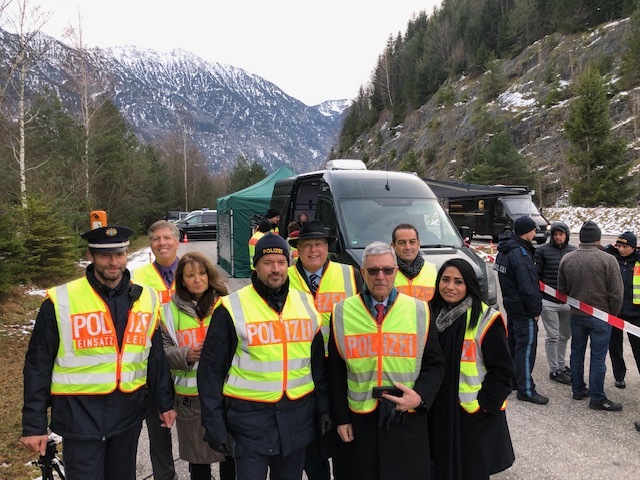 Over eight days we were given an in-depth look at the challenges faced by Europe in general and Germany in particular as, almost two million people from the Middle East and Africa have arrived either to flee danger or to seek a better way of life. We were given incredible access to all sides of the issues. From a political party dedicated to stopping the flow of immigrants, to a governmental agency charged with processing them. From a Moroccan immigrant discovering a new life as a Berlin municipal worker, to a refugee Kurd from Iran stuck in a camp on the Serbian border with Croatia. It will take some time to process all of the information we were exposed to. I will never look at immigration issues–either in Europe or the United States–in the same way. 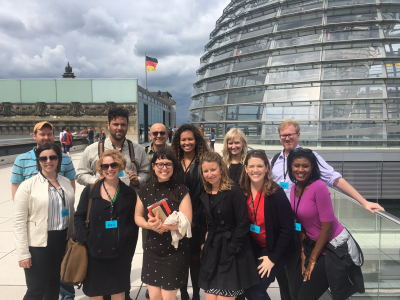 The RIAS Berlin Commission has once again proven to be one of the best international journalism exchange programs. 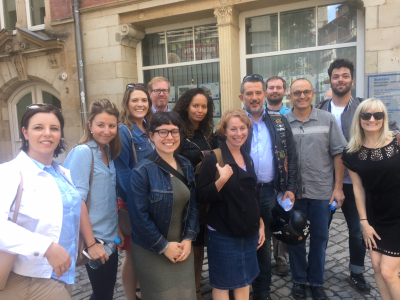 This one-week program took us to briefings with nongovernmental organizations, politicians, police and experts in the fields of immigration and border security in Germany and Croatia. It was great to hear about the various immigration perspectives in Germany, Hungary, Croatia and other parts of Europe. Immigration is the hot topic in the United States, I live forty-five miles from the U.S. and Mexico border in southern New Mexico, for me the topic of immigration and border security in this program was super informative. It was great to meet fellow journalists chosen for this exchange program from many regions of the United States. 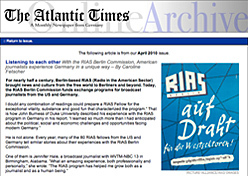 Congratulations to everyone at the RIAS Berlin Commission for a very well coordinated program. Thank you so much for an amazing unforgettable trip. From Berlin and Munich to the borders of Austria and Serbia. Wow! 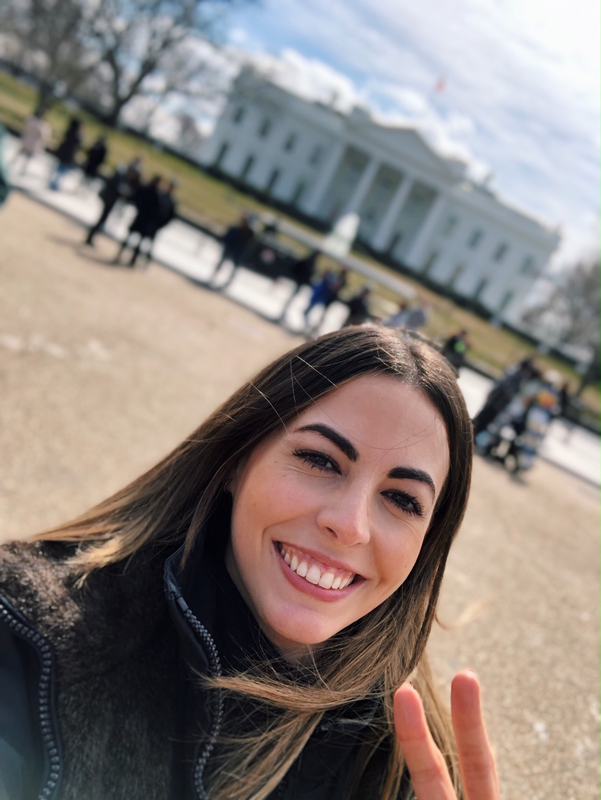 I am so grateful to have the opportunity to be a part of RIAS and to see the places and meet the fascinating people others will never have the opportunity to see. I have learned so much that will add to my knowledge and better inform my reporting. It was a pleasure spending the week with some of America’s best and brightest journalists. I cannot overstate how much I enjoyed the trip and how it will stay with me for many years to come. I will certainly stay in touch and hope to see everyone soon. I’ve been involved in the RIAS program for nearly a decade. My newsroom hosts German journalists every year, but it had been a one-way street. November’s trip to learn about borders and migration was my first visit to Europe. Erik’s reading materials provided good background on what the trip would entail, however the experience was so much more than I could have imagined. Our hosts organized an incredible program; no one could argue that even one minute was wasted! During our one-week trip we visited dignitaries from Germany, Macedonia and Croatia. We got access to important think tanks and people working on the front lines trying to make border policy and enforce it. People were forthcoming during our meetings and I developed a new perspective on migration – it’s not just an issue in the U.S. or in the EU, it is a global issue and it’s complex. 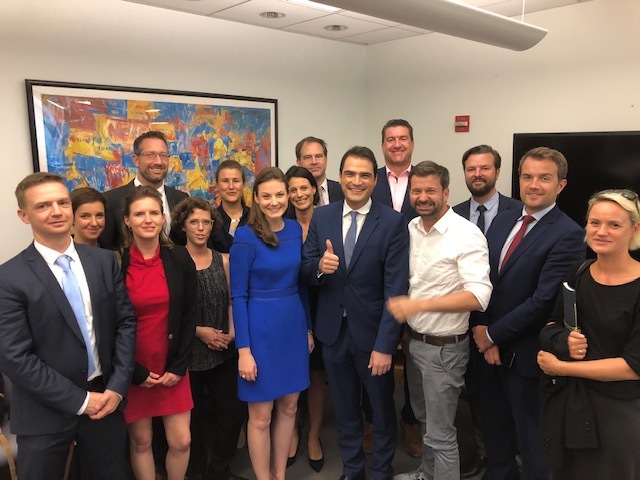 I appreciated that we had the opportunity to meet with people from all sides of the issue, ranging from the Soros Foundation to the co-leader of the AfD party. 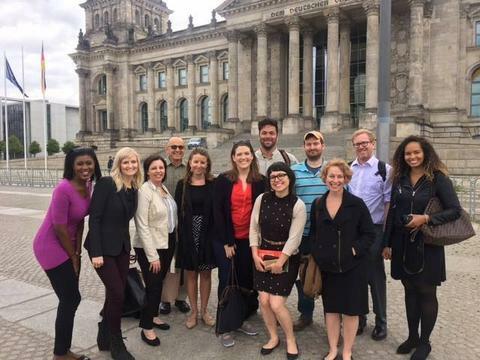 A group of eight American journalists and law enforcement experts recently completed a busy seven-day RIAS Berlin Commission fellowship to learn more about border security and migration in Germany and the European Union. 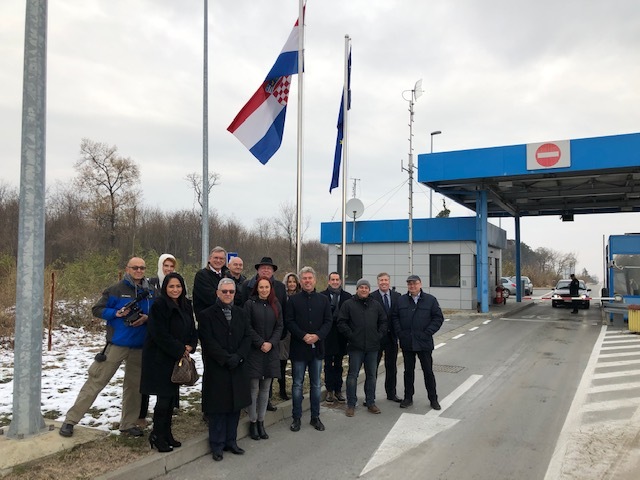 The “senior editor’s” group that included experts on the subjects and RIAS alumni spent the week in Berlin, Munich, Garmisch-Partenkirchen, Zagreb and at border crossings between Croatia and Serbia. Germany and Croatia to learn more about the situation in Europe. Guest speakers included former German Interior Minister Dr. Thomas de Maiziere, Federal Academy for Security Policy President Dr. Karl-Heinz Kamp, European Stability Initiative (ESI) think tank founding chairman Gerald Knaus, AfD deputy parliamentary floor leader Beatrix von Storch, Hungary’s ambassador to Germany Peter Gyökös, leading Bavarian Interior Ministry officials, and Deputy Director of the George C. Marshall Center General Johann Berger. 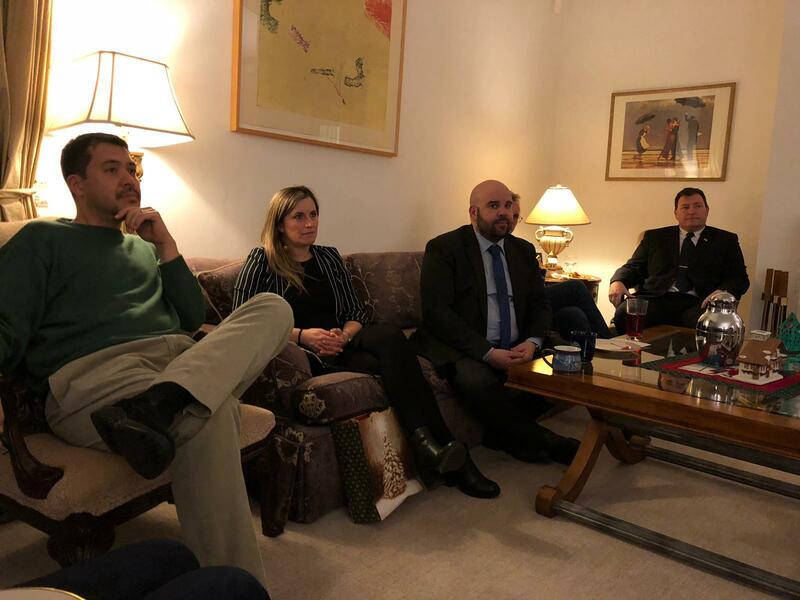 The Americans also had talks with Macedonia’s deputy minister of defence Dr. Bekim Maksuti and Croatia’s deputy interior minister Terezija Gras and Croatia’s head of the border police directorate Vlatko Cvrtila. The journalists on the fellowship, which was organised with the help of RIAS Berlin Commissioner Dr. Hildegard Boucsein, also spent time with Syrian refugees in Berlin who have started a thriving restaurant in the Neukoelln section of Berlin called “Aldimashqi”as well as visiting migrants from Morocco, Syria and Pakistan who are on a three-year job training program at the Berlin Water Works. 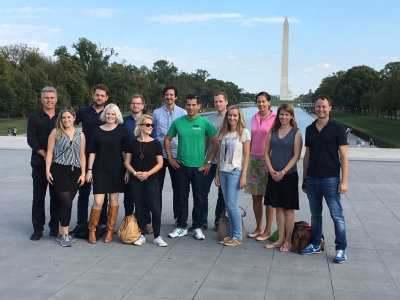 One year ago, a group of eight German journalists spent a week in Texas on a similar program learning about border security and migration on the Texas-Mexico border. 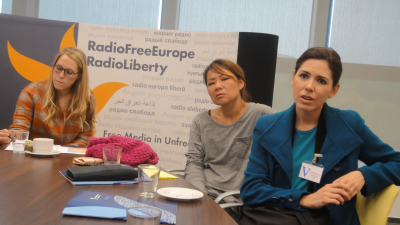 Other stations visited included the new Berlin offices of the Open Society Foundations and the Konrad Adenauer Foundation think tank in Berlin. 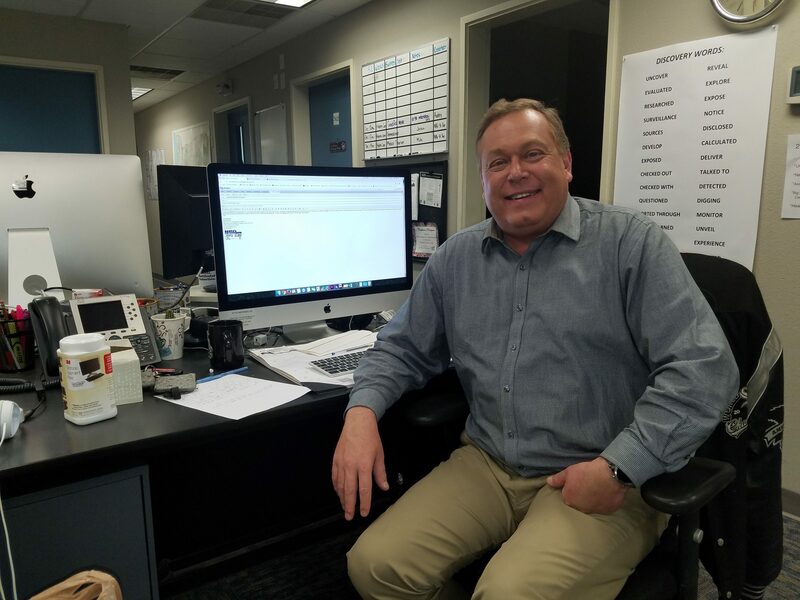 Many of the Americans on the trip to Germany and Croatia this year were working on stories for their TV and radio stations back home in the United States, such as this report from NPR journalist John Burnett that aired on “All Things Considered” on November 30.